Pleasant smells filled the air in Nantong, East China’s Jiangsu province with the opening of an exhibition on traditional Chinese incense on Feb 1, with the event due to run until the end of April. On display are more than 100 items related to incense and the traditional culture that accompanies it, including incense tools, raw materials, calligraphy, painting and cultural performances. Incense was at first used for religious purposes in ancient China and later became popular with the country’s literati. Incense traditions eventually had a major impact on the rest of the country, with people burning it to promote inner peace, and while completing tasks such as making tea and creating art work. The pieces on display at the new exhibition provide visitors with a broad overview of Chinese incense culture. 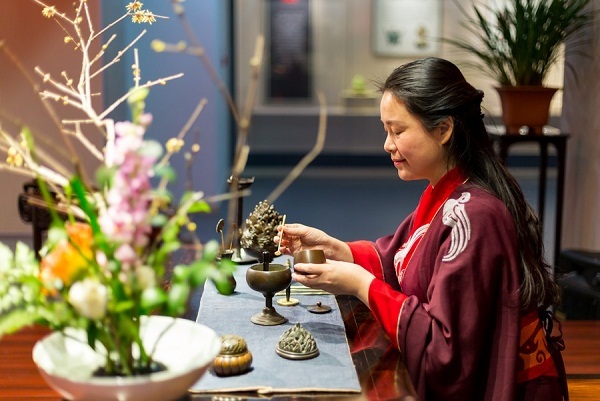 And performers will add to the experience by holding tea ceremonies and creating flower art to show visitors how the burning of incense would accompany these activities.